George Graham Reviews Susan Werner's "New Non-Fiction"
People of my generation, i.e. Baby Boomers, are fond of saying, just like their parents did, that they don't write music like they used to, or specifically, that the golden age of the singer-songwriter was in the 1960s and early 1970s. I beg to differ. While the Woodstock era resulted in some memorable and influential music, from a cold, hard, objective standpoint, the quality of today's best singer-songwriters makes much of the music from the Sixties pale by comparison -- there's better musicianship, better writing, more interesting stylistic blends and a more intelligent approach on average, than ninety percent of the music supposedly from the so-called golden age, much of which has been forgotten by now. 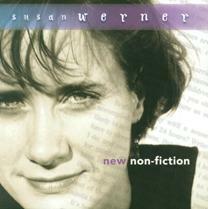 A prime example of an artist of today's generation whose music will stand up to any comparison with Sixties folkies is Susan Werner, whose, new fifth CD is called New Non-Fiction. Susan Werner grew up in the Midwest, having spent her childhood on an Iowa farm. She came to Philadelphia to attend Temple University, where she earned her master's degree in classical music. She has been based in the City of Brotherly Love ever since. After graduation, she did a worked a few temporary jobs before taking up her guitar and getting into the new folk scene, where her great voice and sense of lyrical wit and acumen quickly won her fans. Starting in the early 1990s, she has been releasing a series of mostly independent CDs that have been uniformly praised. She has been touring extensively ever since, both on her own, and as an opening act for such figures as Richard Thompson and Joan Armatrading. The comparison with Sixties performers is doubly apt since, first of all, it's very true, and secondly, Ms. Werner was known for a wonderful song from one of her early albums called Born A Little Late, gently poking fun at her generation which just missed what was supposedly the golden age of the folkies. She also makes passing reference to that era on her new CD, but her music very much stands on its own. It has been over three years since her last CD, Time Between Trains, which I ranked as a masterpiece of the contemporary singer-songwriter art for its outstanding songs, Ms. Werner's very appealing, clear vocals, the remarkably tasteful playing of the studio musicians, and the inspired production of Darrell Scott. New Non-Fiction was produced by Colin Linden, a Canadian with a blues background who has produced a few albums for Bruce Cockburn and also worked with the reformed sixties group the Band. So the sound is rather different from Time Between Trains, exploring some other approaches, including a hints of blues and soul, and there's also a little sonic experimentation which does not always succeed for the music -- more on that later. But the songs and her performance demonstrate why Ms. Werner has been attracting so much attention in the new folk world. She can take a subject that has been visited by hundreds of songwriters in the past, and shed new light. Her vocals again are impressive, and the emotional range of the CD is also noteworthy, from songs of hope to clever wordplay, to a fun rock and roll tune about large automobiles. Joining her on the CD are producer Linden, who plays all manner of guitars, and Dobro, plus Richard Bell on keyboards, who is a part of the re-formed group The Band, bassist Byron House, who recently put in an impressive performance on Chris Thile's Not All Who Wander Are Lost. Others on the Nashville-made recording include drummers Bryan Owings and Kenneth Blevins, and additional bassist Dave Roe. Susan Werner's new release New Non-Fiction is another fine album by one of the genuine bright lights on the contemporary singer-songwriter scene. She has created a wonderful batch of new songs, several of them revolving around passage of time, covering a wide emotional and musical range. Her performance, and that of the band, are first-rate. Sonically, though, the album is a bit of a disappointment. Her last CD, Time Between Trains was on my list for best-engineered CDs of 1998, with its intimate clarity and the understated production of Darrell Scott. Colin Linden's production of New Non-Fiction, is quite different in approach, and the recording and mix, engineered by one John Whynot, succumbs to sonic fads of excessive compression especially on Ms. Werner's vocals, and dark-sounding instrumentation. The sonic processing of Ms. Werner's voice gives it an in-your-face quality that seriously undermines the dynamics of her performances, making her softer moments at least as loud as her more energetic passages. So we'll give the CD about a "B minus." Anyone who thinks that you have to go back 30 years for the best singer-songwriters need only listen to Susan Werner. Her new CD underscores her reputation as one of the best on the scene.